The Rotary e-Club Dolphin Pattaya International presented five new computers worth nearly 110,000 baht to the Child Protection and Development Center in Huay Yai. 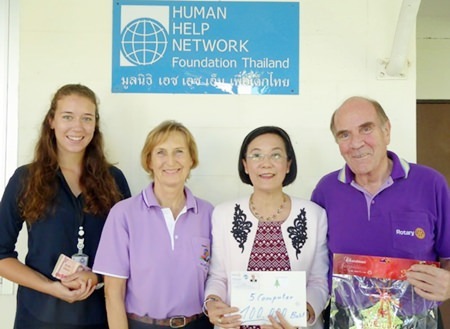 Radchada Chomjinda, director of the Human Help Network Thailand, welcomed club president Otmar Deter and his wife Margret, as well as incoming president Gerhard Cyganek and his partner Nonglak Diraksa Dec. 11. Group picture after the presentation of the computer. In the middle amongst the children are standing from left Nonglak Diraksa, Gerhard Cyganek, Dr. Margret and Dr. Otmar Deter. 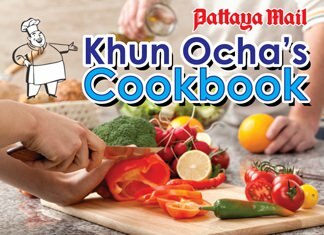 Radchada Chomjinda is standing far left. The CPDC takes special care to educate children not only to have common sense but also to be self-dependent. They go to public schools and even to university. At the center, the children get help with their homework and will be taught other languages. (From left) Volunteer Paula Becker, Dr. Margret Deter, Radchada Chomjinda and Dr. Otmar Deter present money for the computers to Radchada Chomjinda. The children learn to use computers even at an early age and the center supplies a special classroom with teachers for their tech work. The five new Windows-powered machines came with Intel Core i5 processors and a 1 terabyte hard drive donated by the Rotary e-Clubs. They are meant to help students get out of poverty and be self-dependent through obtaining a solid education. 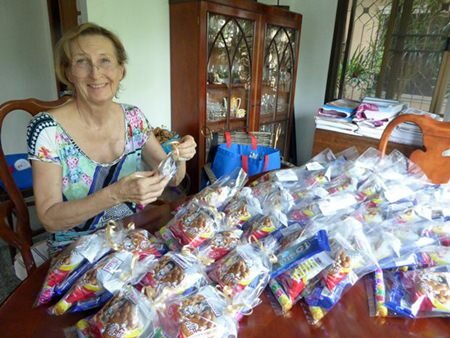 Margret Deter also prepared 71 little sweet treats for all the kids. The kids love the little sweet presents given by Dr. Margret Deter. There is plenty to go around, thank you Margret.